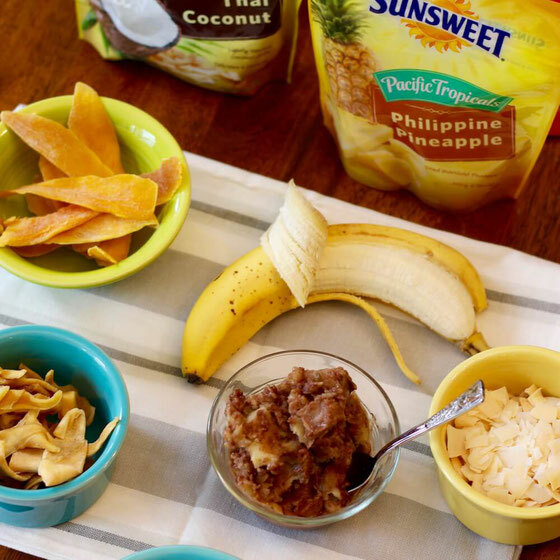 Looking to shake up your snack routine with some tropical treats? Try these ideas! Thanks to the folks at Sunsweet for sponsoring this post. All opinions are my own, as always. Thai Coconut: These coconut chips come from Thailand, and I love how crunchy they are! You get a little bit of iron, which helps your body transport oxygen, as well as some protein, in each serving. Philippine Green Mango: Mangos from the Philippines? Yes, please. These green ones are tangy and a little bit tart. In each serving, you get 2 grams of filling fiber (8 percent of the daily value), as well as a quarter of the daily value for immunity-helping vitamin C.
Philippine Mango: These are my favorite. They're sweet and juicy, which really says it all. Each serving provides 30 percent of the daily value for eye-helping vitamin A and 40 percent of the daily value for vitamin C.
Philippine Pineapple: Sensing a trend here? These are also from the Philippines and are made from hand-picked pineapples. The pineapple offers a bit of blood-pressure-helping potassium, as well as some vitamin C.
While these dried fruits are sweetened with sugar, they're otherwise just fruit and serve as really good stand-ins for more sugary snack and dessert options. I'm going to tell you how I recently enjoyed them! This past weekend, my boyfriend, Lawrence, and I decided to have a movie night at home. Peggy Sue Got Married is one of my all-time favorite movies. You get to see Nicolas Cage when he was super young, so how fun is that?! Wherever you're watching a movie, it can be super tempting to snack on candy, cookies, and other sweets. Instead of going that route, I created little snack cups for us, featuring the Sunsweet Pacific Tropicals fruits. 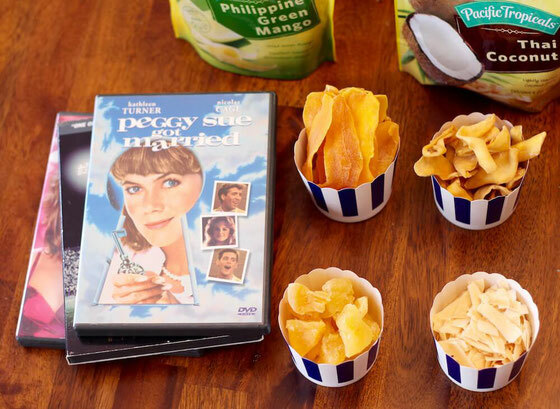 The Thai Coconut was an especially great movie snack, since the pieces are so small—and if you eat them one by one, they last a good while. The next night, I went out to the movies with my friend Natalie, to see a premiere of The Resilient Heart at the Tribeca Film Festival. I brought along a baggie of the Philippine Pineapple. They were so satisfying that I didn't at all miss hitting up the concession stand. I'm one of those people who carries her life in her purse. At all times, I always have a snack, a bottle of water, as well as random other things I consider essential, like a mini lint roller. I made up a little baggie of the Philippine Mango and carried it around for a few days this week as my "just in case" snack. I hate feeling "hangry," and I'm sure the people in my life also hate me being "hangry." 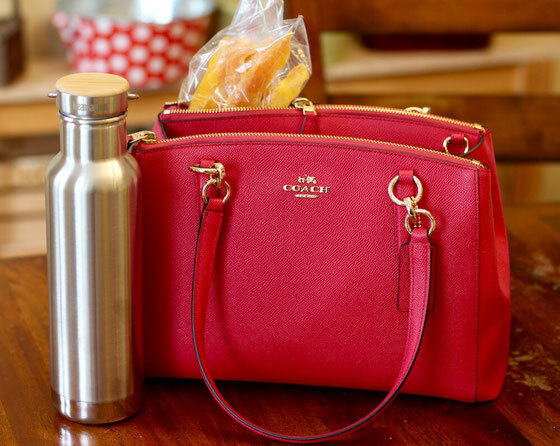 The dried pineapple stayed in my purse until I needed an afternoon snack one day while running errands in New York City. It really hit the spot and definitely was a superior choice over the sugary nuts being sold on the street. Next, I decided to make a toppings bar out of all the dried fruit offerings. 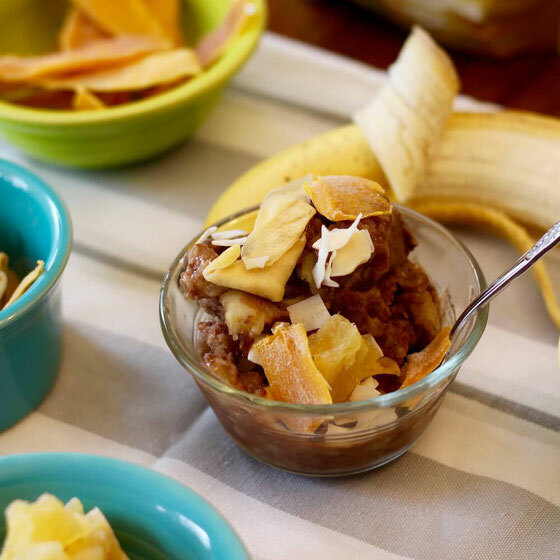 I'm a huge fan of fruit-based "nice cream," and I whipped up an easy Chocolate Banana Nice Cream, using no added sugar (just unsweetened cocoa powder). 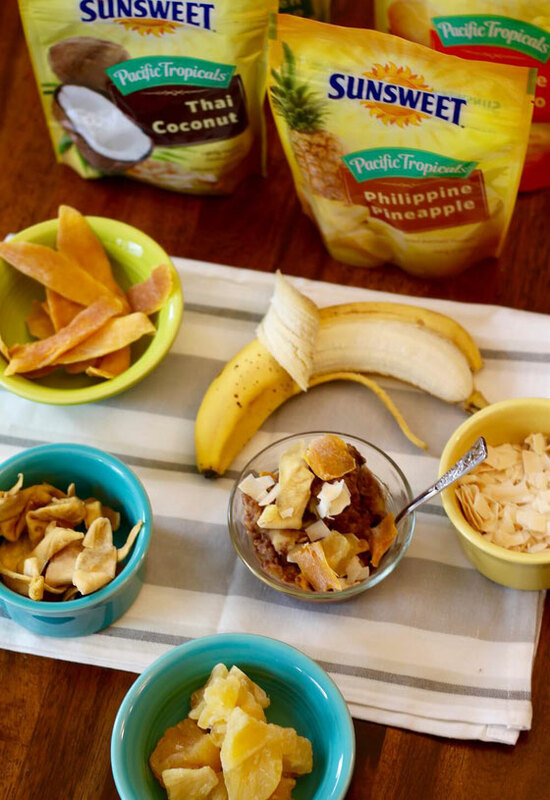 The toppings bar works with almost any flavor of nice cream, so consider giving my Cantaloupe Banana Nice Cream a try, too. I set out all the toppings and went at it! I added a little bit of each to my bowl, although I also think the Thai Coconut would make a stellar topping on its own. And of course, these toppings would absolutely work on traditional ice cream as stand-ins to things like sprinkles or chocolate chips. You're getting nutrition from the fruit, which you can't always say for your ice cream or nice cream toppings! 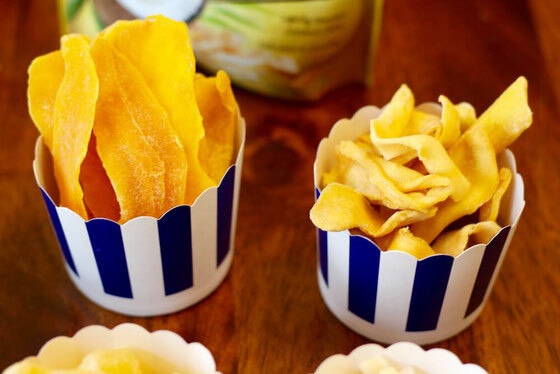 Want even more ideas for snacking with Sunsweet Pacific Tropicals? Follow my Instagram and Facebook pages for more ideas in the coming weeks! What are your thoughts on this topic? Do you snack with dried fruit? What are your favorite snacking ideas for it?